Sometimes Hollywood screenwriters are so preoccupied with whether or not they could do something, they didn’t stop to think if they should. Such was apparently the case during pre-production of the original Jurassic Park, when the film’s best character was almost written out of the script entirely. 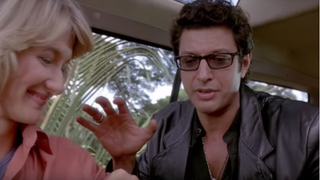 Indeed, even trying to imagine Jurassic Park without Ian Malcolm is like picturing Rocky without Mickey the trainer, or Pretty In Pink without Duckie, or Turner & Hooch without Hooch. (It’s not a perfect comparison, but you get the idea.) Goldblum also ends the interview by talking about how he’s still trying to learn acting, and “I think I’m on the threshold of my better stuff,” as he puts it. If that’s not a promise of something to look forward to, then you may as well write the fly out of The Fly.